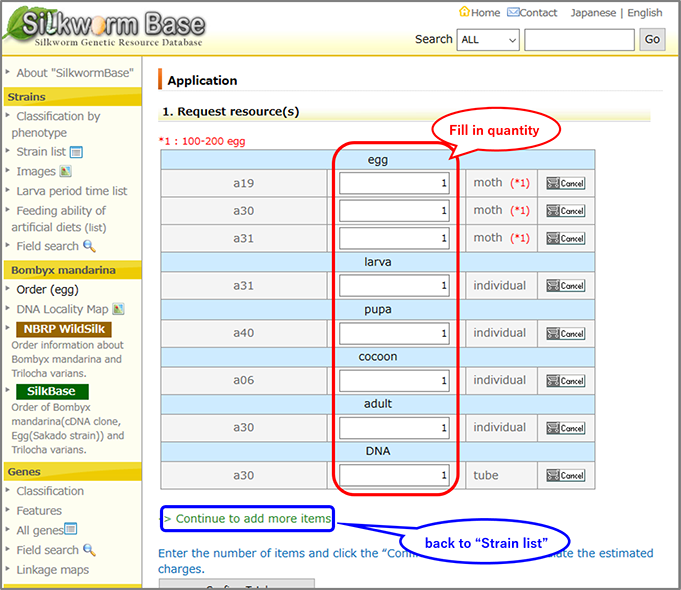 A web order can be placed from the “Strain list” page. 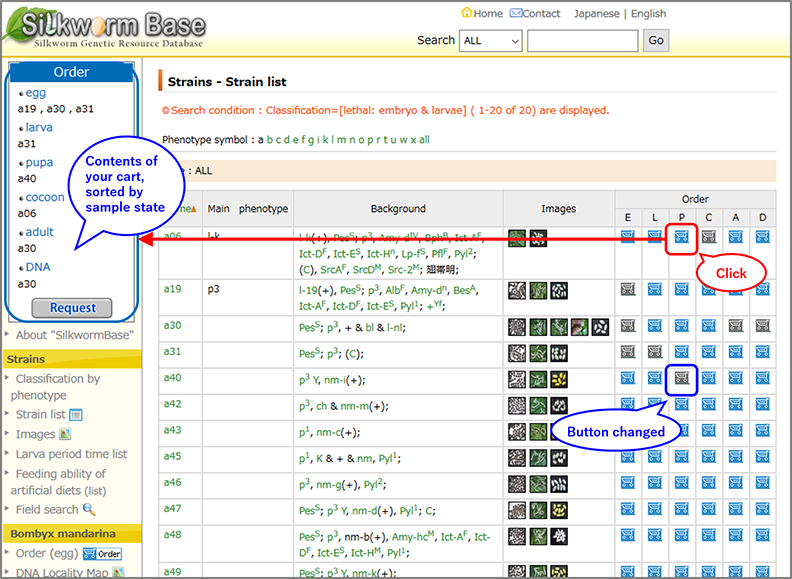 First, click on the “Strain list” link on the left menu of this page in order to go to the “Strain list” page to browse for strains. 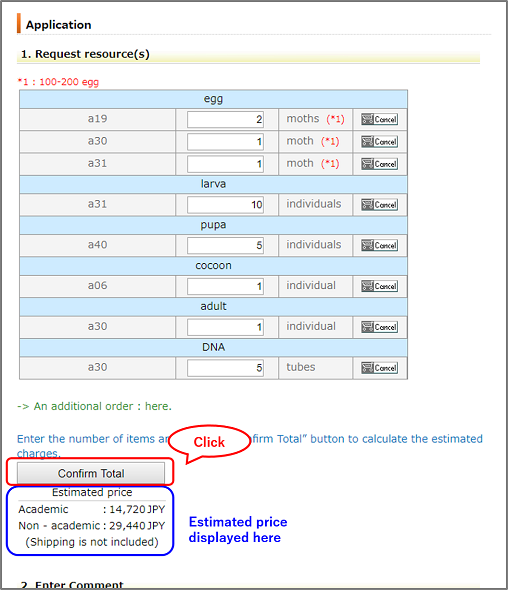 Next, click on the “Order” button for the corresponding sample state (egg, larva, pupa, cocoon or DNA) to place the strain into your cart. The contents of your cart will be displayed in a box titled “Order” at the top of the left menu and will be sorted by the sample state of the items. When you are ready to proceed to checkout, click the “Request” button at the bottom of the “Order” box to proceed to the Application page. 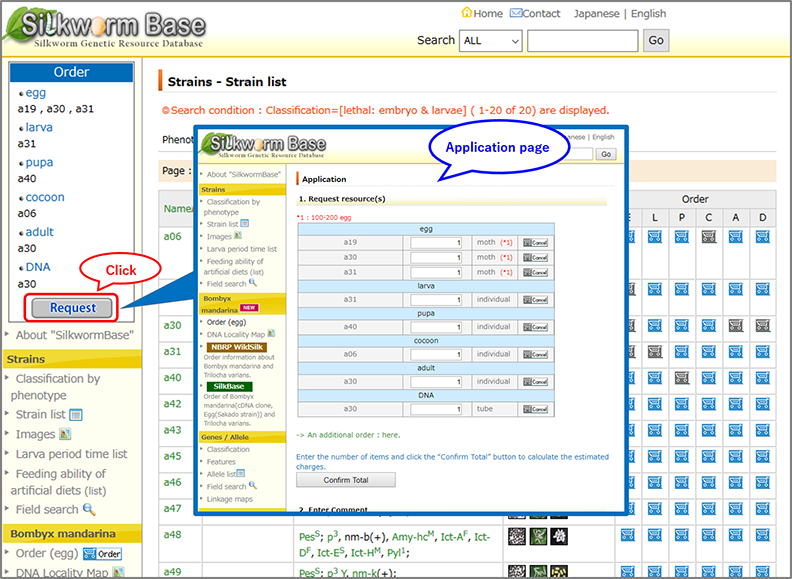 Be sure to fill in the quantity for each strain on the Application page. The default number would be 1. You can add more strains to your order by clicking “Continue to add more items” or by clicking “Strain list” on the left menu. Click the “Confirm Total” button after entering the quantity of strains you want to order. An estimated price will be displayed. ※You cannot place your order if you do not confirm the order quantity of your strains. Please inform us if you want to request for a specific shipping date or if you have any special requests. Please enter your personal information so that we can contact you to confirm your order and to inform you about the delivery of your strains. Enter your email address and the system will be able to retrieve your registered information. Click “Next” once you have entered your email. Please enter your name, address, etc. Please be sure to enter the correct email address. Click “Confirm” once you have entered the required information. Please confirm the details of your order as well as your personal information. 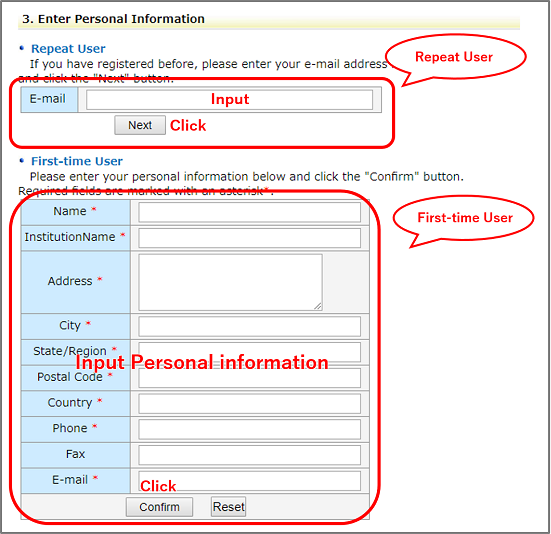 If necessary, you can edit your personal information from this page. You have successfully placed a web order. A confirmation email will be sent to you after you click the “Send” button. Please verify the details of your order as stated in the confirmation email.